The WCM-Serial Ethernet Converter is a Ethernet to Serial (X.21, V.35 or EIA-530) service delivery unit, offering end to end management using 802.3ah OAM, and customer site conversion from twisted pair 10/100/1000BaseT Ethernet and 100Base/1000Base-X fibre to Serial (X.21, V.35 or EIA-530) leased line services. The WCM-Serial is a member of the MetroCONNECT family, offering Managed local Ethernet Switching at up to 1Gbps and LAN extension over serial services. Support is offered for fractional (including Nx 64Kbps) X.21,V.35 and EIA-530 services up to 20Mbps.The WCM-Serial supports auto negotiation and auto MDI/MDI-X cross-over switching on two RJ45 LAN interfaces.A further LAN interface is provided via an SFP port, offering either an additional RJ45 connection or a variety of multi-mode and single-mode fibre interface options. Link Loss Forwarding is supported, whereby faults on the uplink port will automatically force a link down on the user ports to indicate to the attached devices that there is a link problem.The transmission of Jumbo frames is supported, with internal packet buffering used to smooth out bursty traffic without packet loss. Management is offered via each of; Serial Terminal connection, Telnet, SNMP or Web Browser application. Management security is offered via SSH and TACACS+ authentication. Support is also offered for ‘Carrier Ethernet’ Link OAM Management (IEEE802.3ah), enabling status information to be shared with connected equipment if required. In line with all other members of the MetroCONNECT Ethernet Service Delivery family, the WCM-Serial supports Metrodata’s zero-touch’ installation process, minimising both on-site installation time and the Engineering skills required. Our unique ‘IP proxy over OAM’ functionality reduces on-site installation to a ‘plug and play’ exercise, simply checking that Ethernet link-up LEDs indicate correct physical connectivity. Comprehensive Telnet and/or SNMP remote management is available to the device via an IP proxy process across Layer-2 OAM traffic from an MC12000 Service Delivery chassis or another MetroCONNECT family device at the network centre, with no need for layer-3 (IP) parameters to be assigned locally. If required, individual configuration can be subsequently downloaded via TFTP. The WCM-Serial supports VLAN in two ways. In normal mode,VLAN tagged frames are passed unmodified; however when VLAN support is enabled, the WCM-Serial supports VLAN tag-based switching whereby access may be controlled using VLAN IDs.The unit is password protected for Telnet access for security, and for SNMP is configured with a primary and multiple back-up NMS stations. SNMP access will only be accepted from an authorised NMS. The WCM-Serial is available in a choice of 100-250 VAC or -48 VDC integrated power supplies. The WCM-Serial can easily be rack mounted in either a 1U two unit rack mount kit , a 6U eighteen unit rack mount kit. The WCM-Serial is part of a wide range of LAN extension products from Metrodata. 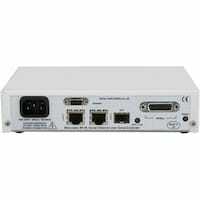 This application shows an MC12000 MetroCONNECT chassis with WCC-Serial modules, supporting multiple WCM-Serial strong Ethernet to Serial (X.21, V.35 or EIA-530) LAN Extension Demarcation Devices. The MetroCONNECT and WCM-Serial together offer LAN Extension and Ethernet demarcation, with remote management via 802.3ah OAM. Various service delivery options are available including fibre, copper, and fibre plus copper to a Serial (X.21, V.35 or EIA-530) circuit. Comprehensive remote network management access is available via the MetroCONNECT including end to end remote management using 802.3ah OAM. 10M, 100M and Gigabit Ethernet applications can all be supported, as can Mini Jumbo frames. This application shows an WCM-Serial unit being used as the Ethernet demarcation device to deliver a Carrier Ethernet service from an strong MPLS core network. A wide choice of Ethernet connectivity is available for the user via the 10/100/1000baseT and SFP fibre ports. OAM support means that the WCM-Serial can be remotely managed by the central network management system using standards based OAM packets. This application shows how a pair of WCM-Serial units can be used to offer Ethernet service demarcation and LAN Extension functionality over a Serial circuit.